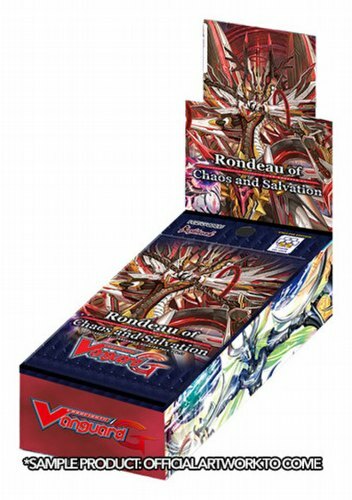 Cardfight Vanguard: Rondeau of Chaos and Salvation boosters are the very first clan booster for Link Joker! 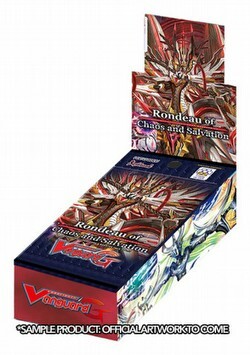 A "Messiah" deck can be constructed with this product combined with the upcoming Messiah Dragon of Rebirth trial deck. A "Star-Vader" deck built around "Chaos Breaker" can also be constructed with cards from just this set. Cards that strengthen the "Glendios" and "Deletor" decks are also included. Each pack contains 7 cards (2 of which are R or better). There are 45 cards in the set (41 new cards & 4 reissued cards) - 2 GR, 6 RRR, 8 RR, 13 R, 16 C, plus 8 SP, 2 Super GR, and 4 Special Reissues.